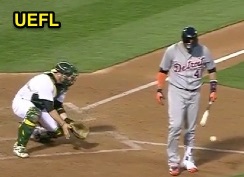 An interference-aided double play call by umpire Joe West helped Oakland escape a first-and-third jam in the top of the 5th inning of the Tigers-Athletics game, ending the frame as a Detroit batter's actions produced both the second and third outs of the inning. 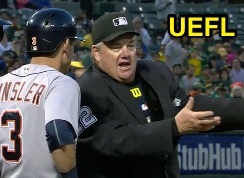 Country Joe West explains his call to Kinsler. With one out and two on (R1, R3), Tigers batter Victor Martinez hit a fly ball down the right field line and in foul territory, where it was caught by A's first baseman Yonder Alonso. In an effort to hold the runner at third (R3 Ian Kinsler), Alonso fired home to catcher Stephen Vogt as Martinez walked dejectedly from his batter's box back to Detroit's dugout. Replays indicate Alonso's throw subsequently hit Martinez's leg and caromed away from Vogt, and HP Umpire Joe West ruled Kinsler out as a result. This is interference and was correctly officiated. Rule 6.01(a)(5) specifies this brand of interference: "Any batter or runner who has just been put out, or any runner who has just scored, hinders or impedes any following play being made on a runner. Such runner shall be declared out for the interference of his teammate." V-Mart pays no attention to the ball hitting him. Reviewing this play, the batter hit a fly ball to the first baseman, who caught the air out, thus retiring the batter (putting him out). The first baseman then, in making a play on the runner at third, threw toward home plate, where the batter absentmindedly walked into the throw, and thus interfered with it. * Bear in mind that recently-put out interference 6.01(a)(5) does not require that the interference be intentional or deliberate: the burden or standard is lower and only requires that, first, the batter/runner has already been put out (or scored a run), and, second, he hinders or impedes a following play relative to another runner. Deflecting the course of a throw that otherwise meets the criteria constitutes such interference, and Umpire West properly declared R3 Kinsler out for the interference of teammate B1 Martinez. *NOTE: The fielder made a play on the runner by keeping him at third. "Making a play on" may be confusing since the runner didn't get to home plate and wasn't tagged nor was there a tag attempt, so think of it in terms of, "Why did F3 throw to the catcher?" If the answer is, "Because of the runner at third," then he indeed has satisfied the "play being made on a runner" criterion. In other words, would he have thrown home had there been no runner at third base? Probably not.